Best for Homes with Pets and Allergy Sensitivities. 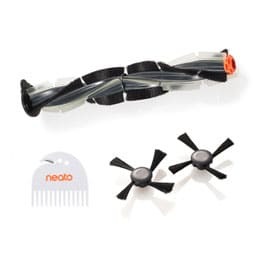 The Neato Botvac Series Brush Kit keeps your Neato robot working at peak performance. Includes the Combo Brush which offers superior pick-up of pet hair. Plus 2 side brushes keeps your robot cleaning close to walls and deep into corners. The Cleaning Tool lets you keep your brush and filters clean. Compatible only with Neato Botvac Connected and Neato Botvac D Series robot vacuums.